The first thing one must do when making a documentary film is to research the subject. This involves watching any existing films as well as footage (unedited film) and making sure you get your facts right about what was going on at the time. First step was to find the documentaries that were made about the 1989 Revolution and I assumed there would be several Romanian productions to choose from. to the archivist at CNC, Romania’s national cinematography centre, 11 teams of filmmakers were sent out from Buftea Film Studios to document the events as they were unfolding. The archivist told me that TVR didn’t make a documentary at the time as they didn’t want to “inflame public opinion”. unscripted, uncontrolled (and inspiring) scenes like that on TV. charged, let alone convicted, for their role in the bloodiest regime change of that tumultuous year. in 1989, by Bose Ovidiu Pristina, but the film seems to be unobtainable and the filmmaker has unfortunately died. 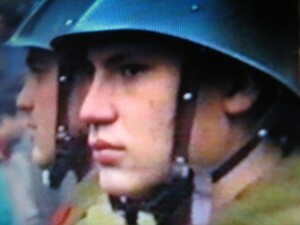 The archivist at CNC explained that the BBC bought much of TVR’s footage and made a documentary, and many people mention the German production “Videogramme from a Revolution” — consisting of material shot almost entirely by Romanian cameramen. documentaries so static and boring. But the worst material I saw was TVR’s news footage after December 22nd 1989. The material they shot is interesting — burning buildings, tanks, soldiers, crowds on the streets — but the voiceover is nauseating. Rather than let people watch the events as they happen, events that require no explanation, the TVR newsmen felt the need to constantly talk — about the tyrant, the sacrifice, the tens of thousands killed, the bright future we can all expect now there has been a real revolution. All of this is very encouraging as it makes me realise what great material we have to work with for our film. A Romanian translation of this article was published in Dilema Veche. 7 Responses to Why no Romanian documentary about 1989? It’s always nice to get feedback, even if it is hate mail. It’s also typical that one filmmaker hates the work of another. And I plead guilty to the fact that I have never heard of Cornel Mihalache or his films, and I have been asking around for months so it would seem plenty of others haven’t heard of him either. I wrote him an email asking where I can get a copy of his work as I would like to see them. Hi Rupert! I want to congratulate you for the article. It was a nice surprise to see you in Dilema Veche that is my favorite paper. I am sorry to say but I also have not heard about Cornel Mihalache’s documentaries. I kindly ask Mr Cornel to show it to us. I am quite curious as the only decent documentary I have seen about this events was a french one a couple of years before. After that I have ceased to have any interest in finding out new things about this events (not about the revolution itself )and i continued my superficial life in ignorance. In 20 years I did not get too much info so i am sorry to say this but I have lost my interest to find more. So, this is why I congratulate you Rupert! It is a great thing you, at least, try to find more…and you are judged for this of course!! What about me and other millions of people that do not even care anymore. Maybe your documentary and Cornel’s one will start another revolution in my head. I am looking forward to it!!! If the issue of finding documentaries about the 1989 events in Romania is so controversial, you can imagine how controversial the actual events must be. Regarding the first comment above, by Cornel Mihalache, the guy who says ”I must suicide me after your article”, I found out that he is an old timer at TVR, the state owned TV station of Romania. I wrote to Mr Mihalache and he invited me to come to his house and see these films but I didnt go, perhaps because I couldnt face watching through hours of TV documentaries — pieces or work that are generally not documentaries at all, but journalistic reportage. Also, TVR is perhaps the worst state owned TV station in the EU and I cant bear to even think about their coverage of the revolution, let alone watch it. How can I say TVR is the worst? Well, is there another EU member state that has such a bloated bureaucracy (over 3000 employees) running their TV station, which can barely produce their own programmes, has absolutely no budget and is run by a bunch of squabbling pensioners whose only quality is loyalty to the ruling party? I really wonder if the viewing public would notice if they fired 99% of TVRs employees (leaving 30 people to run the tapes and read the news). A number of films labelled ‘documentaries’ have been produced in the Sahia studio around 1991-1992, the most well known being Ada Pistiner’s Ziua cea mai lunga, Serban Comanescu’s Desprinderea, Adrian Sirbu’s Primul jurnal liber (or so) and, of course, Mihalache’s De Craciun ne-am luat portia de libertate. NB I am not attaching value here, just listing some of the titles that managed to appear meaningful in the early 1990s in both professional and lay contexts. I am confident that all the titles listed above are familiar to those in the know re. the whereabouts of the domestic documentary. However, those films would be less familiar to the lay audiences of today (e.g. a post above), and that would be for a number of reasons, including the poor (technical and otherwise) quality of the films, their (subsequent) minimal circulation in the recent years, and the changed understanding of what documentary ‘is’ or ‘should be’ in Romania (i.e. what meant something to us as a piece of documentary cinema in the early 1990s is less able to have a similar impact today; we have – finally ! – become more critical when it comes to nonfiction). Anyway, the idea is that you can do better than erasing local doc history in order to make room for Productive’s new pic. Rather than stating that it comes to cover that huge gap on the (domestic and, maybe, international) market, it might be fairer and more productive just to place it against the existing body of films covering the same context, and letting audiences decide what it brings new. What about a public screening of all the above titles in Bucharest in December 2011? To go back to some of the comments to your post: Mihalache’s film is known by those who know the whereabouts of domestic non-fiction. While some might find the film dated, I had it screened last year in a Swedish context and it seemed to work rather well. I can see no tv stylistics there – although, you are right, most of M’s later work falls into that category. As for deeming Ujica and Farocki’s Videograms ‘static and boring’, allow me to consider that a rushed judgment; that film has nothing to do with the (truly static) tv products driven by a blanket voice-over. Many of us may be put off by the v.o. as a form of didacticism or a means of controlling meanings, but that is hardly the case for the ‘reflexive’ voice in Ujica’s film. Would you also find boring Herzog’s v.o. in Grizzly Man (a voice which shares similar qualities)? Some of humanity’s greatest works have come out of what you refer to as ‘confortable armchairs’. In that line of thought, not all documentaries have to be observational or verite, i.e. with no ‘meta’ level that might diminish the (delusional, in my view) transparency of the filmed document. To me, Videograms remains the quintessential ‘Revolution (essay)doc’;but that is, obviously, just a personal opinion (which I am ready to defend). Thanks for reading my long-ish post. And, yes, I would love to see Laurentiu’s film. I’ve known L. for quite a while, therefore I will get in touch to beg for a screener. so mister mihalache DID invite you to view his footage and you didnt accept? that says everything about your intentions.